Hi YABC readers! I'm so excited to be sharing the cover of Through the White Wood with you. My name is Jessica Leake, and I'm the author of Beyond a Darkened Shore and Through the White Wood. 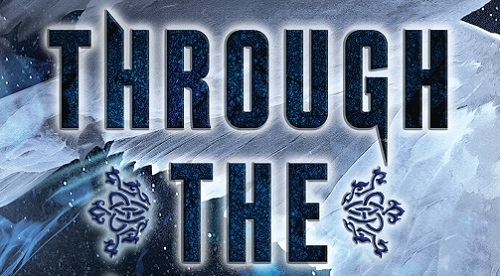 Although it's not a sequel to Beyond a Darkened Shore, the two main characters (Ciara and Leif) from Beyond make an appearance in Through the White Wood, and I think you'll see that the covers complement each other extremely well--I can't wait to see them side-by-side on my shelf, and I hope you feel the same! This is a story that takes place in a little-known period of Russian history: the 11th century, when the country was new and creatures of folklore and legend still roamed the world. I wanted the cover to reflect the snow-capped forests of a cold and beautiful world, and I think the cover designer at HarperTeen (Michelle, the same person who designed Beyond!) did an incredible job. I hope you love it as much as I do! Jessica Leake is the author of Beyond a Darkened Shore and Through the White Wood from HarperTeen and the adult novels Arcana and The Order of the Eternal Sun. She worked for years as a psychotherapist, but even though she loved her clients, she couldn’t stop writing. She lives in South Carolina with her husband, four young children, lots of chickens, and two dogs who keep everyone in line. Visit her at www.jessicaleake.com. One winner will receive a signed ARC of THROUGH THE WHITE WOOD, when available. I am very interested in this synopsis! As a historical fiction fan, I've never read a story set in this place and time, and it sounds like a page-turner! First off the cover is so beautiful and compliments Beyond a Darkened Shore perfectly and I personally love how the birds and their colors correlate with the title. Now for someone who has always loved anything with a few good protagonist with powers this sounds absolutely amazing. I read Beyond a Darkened Shore in about a day and was so happy with. The story building and the factual correctness of the book was outstanding I was really happy with it and can't wait for what Jessica Leake has in store for these other characters. (And I'm so happy that Ciara and Lief will make an appearance in the next book). So excited for this next book in the series- the cover is an interesting continuation of the previous! I'm excited to dive into the next book of Jessica Leake's series! Definitely love the cover on the newest book! I keep having to go back and stare at it. It's so eye catching! I love how this cover compliments the first book. This series really seems amazing!! The cover is drop dead gorgeous and the synopsis sounds interesting! The cover is stunning and powerful.